This plan contains good feature of the conventional plans and the flexibility of unit linked plans. It provides higher cover, smooth return, liquidity and considerable flexibility. In this plan one has to choose the premium he wants to pay whereas in normal plans one chooses the S.A. under this plan death cover will be same irrespective of age at entry and term. The sum payable at maturity however differs for different entry age and terms. 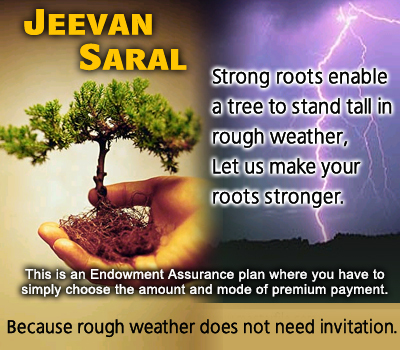 This plan is very appropriate for employees seeking life cover through salary savings schemes. Guaranteed surrender value (GSV): the GSV will be equal to the 30% of the total amount of premium paid excluding the premium for the first year and all the extra premiums and premium for accident / term riders. Discounted value or accumulated value, as the case may be, of the following: 80% of maturity S.A. if 4 years premium have been paid, 90% of the maturity S.A. if or more years but less then 5 years premiums have been paid and 100% of the maturity S.A. if 5 or more years premium have been paid. The loyalty additions, if any as announced while declaring the results of the corporation’s valuation as on 31st march, immediately preceding the date of surrender. Auto cover: the plan offers auto cover of 12 month after the policy has been in force for a period of 3 years or more. Flexible term: the policyholder can choose a maximum term but can surrender at any time without any surrender penalty or loss. Partial surrenders: the plan will allow partial surrender from 4th year onwards subject to certain conditions for which please refer to policy document. Due to existence of the flexible term and partial surrender the policyholder will enjoy a lot of liquidity under the plan. The plan also provides for 15 days free look period”. Optional rider: term assurance rider, accidental death and disability benefit rider is available by the payment of an addition premium. Maturity sum assured (MSA): has to be calculated on the basic premium only, before mode rebate & death accident benefit. Example: Mr. XYZ is 25 years old and is working in an IT firm as software engineer. He opts for jeevan saral plan for 15 years term and chooses monthly basic premium of Rs.500/- after adding DAB premium of Rs.510 (500 x 250 = 1,25,000 x 1/1000 x 1/12 = 10 + 510). On maturity he will receive Rs.97655/- as maturity sum assured (MSA) + Loyalty Addition which will be decided by the corporation. If he dies after 4 years, his nominee will get Rs.1,25,000 (250 x 500) + premium paid for 4 years – first year premium = 1,25,000 + 24,480 – 6120 = 1,43,360/- + Loyalty Addition, if any.